The Grant Museum shares its building with the UCL Medical School (we moved in to what was once the Medical School’s library in 2011), and Elpida’s work has brought some of the cutting-edge research that our neighbours are undertaking into the museum. 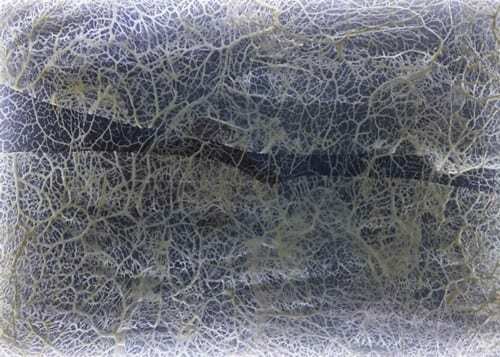 Internal Beauty is an exhibition resulting from Hadzi-Vasileva’s residency in biomedical research labs, (funded by Wellcome Trust), considering nutrition, our gut and how man-made, microscopic materials can fix problems. Exploring current research into regenerative medicine, the new artworks use biomedical materials being developed by Dr Richard Day, Dr Giles Major, Professor Alastair Forbes and associates, at University College London, University of East Anglia and University of Nottingham. These include biological and synthetic materials, such as microparticles, which have been designed to replace or treat diseased tissues. 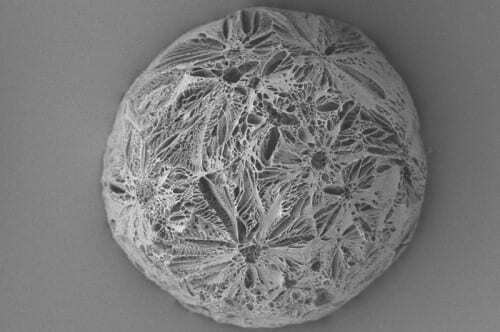 Highly porous polymer microparticle made using a Thermally Induced Phase Separation process, 200 microns in diameter, 2015. Courtesy Dr Richard Day, UCL. The scientists she worked with are developing and testing biodegradable microscopic spheres, which are implanted in people’s bodies to slowly release pre-loaded drugs, or to provide a scaffold for damaged tissues to regrow. The properties of the spheres can be tailored to meet specific medical requirements for size, drug-delivery and how quickly they are broken down by the body. The research focusses on designing the microparticles to achieve healthcare benefits for a wide range of conditions that are currently difficult to treat. This includes new approaches to improve bowel and bladder health, such as incontinence and fistulas (abnormal connections between adjacent sections of intestine); improving blood flow through blocked blood vessels; and delivering drugs in a controlled manner for diseases including diabetes, cancer and infections. Alongside sculptures and prints inspired by the microparticles, other works are made of the organs that the researchers are working on treating (or more accurately, the equivalent organs from non-human animals). By taking these organs through a process similar to tanning leather, Elpida has transformed these challenging structures into artworks. She both sculpts with these body parts, and uses them to make prints from (either with more traditional ink, or with the original bodily fluids they were coated in). Other parts of the exhibition use objects we might expect to find in the museum already – such as mice skulls, bird skeletons, rabbit jaws and skate wings which themselves were by-products of biomedical research. 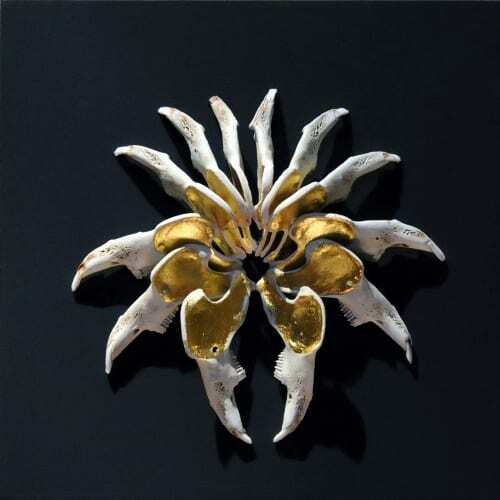 Elpida has arranged these specimens into sculptures, sometimes gilding them in the process. While they look very much at home amongst our traditional museum displays, at the same time it is very easy to spot which ones are artworks. 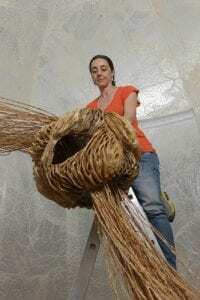 Working with artists like Elpida Hadzi-Vasileva gives us a chance to explore both cutting-edge biomedical research and objects we’ve had in our collections for nearly two centuries through a new lens. Internal Beauty by Elpida Hadzi-Vasileva runs until March 28th 2018. Full details are on the exhibition’s website.